You may or may not have noticed that I didn’t share a post last week. I have taken a week off for vacation before but this was different. I want to share with you why I was absent last week. I’m hoping to connect with you on a deeper level so read on if you are interested. Scroll to the end if you just want the easy Kale Salad recipe that is toddler-approved. There have been some big changes happening at our house this past month or so. Some of these changes have been positive like hosting a couple of wonderful international students and others negative like my husband being laid off. We have had a lot of adjusting to do along with re-examining our values and family goals. It has become clear to me that I have started to drift off course from my two most important values. These are LOVE and RELATIONSHIPS. I feel like I’ve become obsessed with completing my “to do” list and spend too much time worrying about the future. I’ve allowed myself to slip into a scarcity mindset. I found myself noticing everything I perceived to be lacking in my life and I lost sight of how fortunate I really am. After spending some time with my soul, cracking it open, shedding tears and asking myself lots of important questions, I came to the conclusion that I need to focus on deepening my relationships and connecting with more like-minded souls who value LOVE and HEALTH as much as I do. My purpose and passion is to spread love and connect with people through nourishing food. More specifically, I want to show people how easy it is to feed themselves and their families healthy delicious food without spending all day in the kitchen. I have also declared a “challenge” for myself that I could use your help with. My challenge is to connect with you on a deeper level. The best way I know how to do this is through speaking and listening to you one-on-one or at an event/workshop. I want to spend less time on Facebook and more time connecting and sharing my passions in person. I value the opportunities that virtual spaces offer but I would prefer to look into your eyes and “see you.” I know that may sound scary and uncomfortable but I promise you it’s worth it. Now that I’ve shared my struggles, values, passions and the challenge I’ve created for myself, I invite you to connect with me and share what you’ve been up to and anything you’ve been struggling with. Maybe there is a “challenge” you would like to declare and I could help you with. 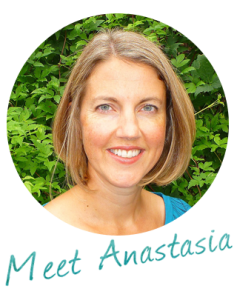 You can give me a call, set up a skype chat, and invite me to tea or to speak at your next gathering or event. I can’t wait to connect with you and deepen our relationship. 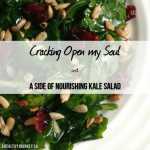 Now here is the yummy recipe for the easy kale salad I promised you. Whisk all the dressing ingredients together at the bottom of your large salad bowl. Transfer the chopped kale into the large salad bowl. With clean hands, massage the dressing into the kale for a few minutes or until the kale has softened. Stir in the dried cranberries and let the salad sit for 15 minutes. Top the salad with the toasted sunflower seeds when you are ready to serve it. To save time, buy the pre-washed baby kale pieces instead of whole kale. Loblaws sells lots of these in the produce section. Thanks for sharing your gifts, Ana, and your struggles. Wishing you success and fulfillment of your best dreams. Thank you, Cyndi! Wishing you all the best too.